Need a Pick-Me-Up? 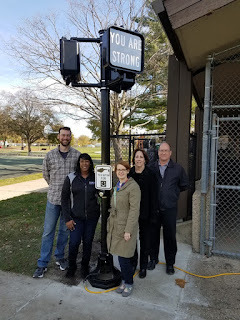 Visit "Affirmation Station"
The Public Art League is proud to welcome "Affirmation Station" by artist Timothy C. Flood to the Douglass Park Community Center in Champaign. Patterned after a pedestrian crosswalk sign, "Affirmation Station" displays two positive static messages with a scrolling display of around 125 positive messages. In addition, the piece contains a push button which, when pushed, plays one of over 270 positive audio messages. 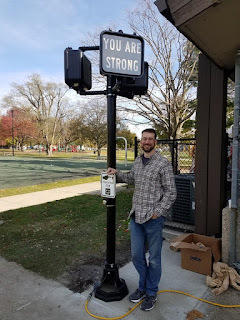 Timothy C. Flood states the "overall idea behind "Affirmation Station" is to place that little spark of positivity into someone's day that may help shape it to turn out great." He further states: "Everyone could use a little pick-me-up once in a while and sometimes positive thoughts and statements are hard to come by. 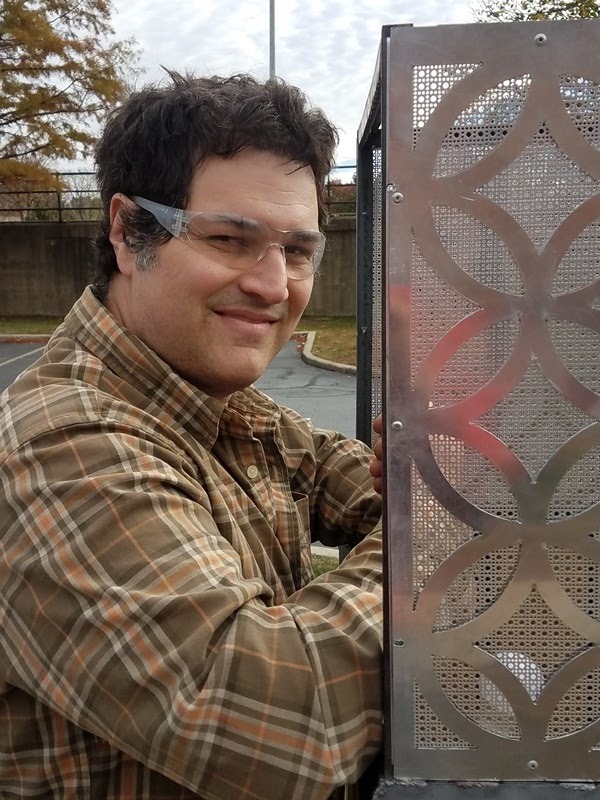 'Affirmation Station' is designed to fill this need to the public at large. Through static and dynamic lit text messages and an interactive audio element, viewers of the artwork can choose for themselves whether to receive the message at a distance or have a close encounter with the work." 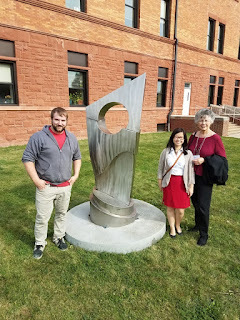 A big thanks to Ann & Greg Petry for the sponsorship of the piece. Also, a big thanks to the Champaign Park District for providing the site and assisting with installation. 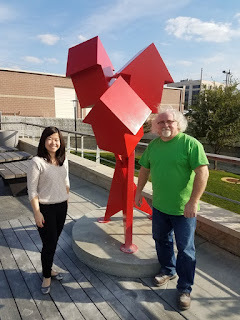 The Public Art League proudly welcomes "Beacon" by local artist Michael Collins to Downtown Champaign. The sculpture is installed by the roundabout at Main and Chestnut Streets near the "Old Depot" (which houses Black Dog Barbecue). Lights within "Beacon" illuminate at night. The owners of the Old Depot also plan to add landscaping around the sculpture. "Beacon" is constructed of steel, aluminum and black locust wood and stands over 8' tall. The artist states that "Beacon" is a work that brings together a history of architectural references, geometric patterns, and a broad range of materials together as a sort of architectural streetlight, or miniature urban lighthouse. This piece serves to perform as a focal point for people to meet at, have a conversation around, or to simply enjoy its form, anchoring its location as a point of reference. There is a duality that exists between the range of visual texture seen in the daytime, from the reflectivity of the faceted aluminum panels, to the natural tones of wood, contrasted in the nighttime by the inner glow from diffused lighting, the silhouetted geometric patterns, and cast shadows around its base. Besides being a focal point in the daylight, I wanted this work to charge the evening time and activate a space with a mellow glow, akin to a chiminea. 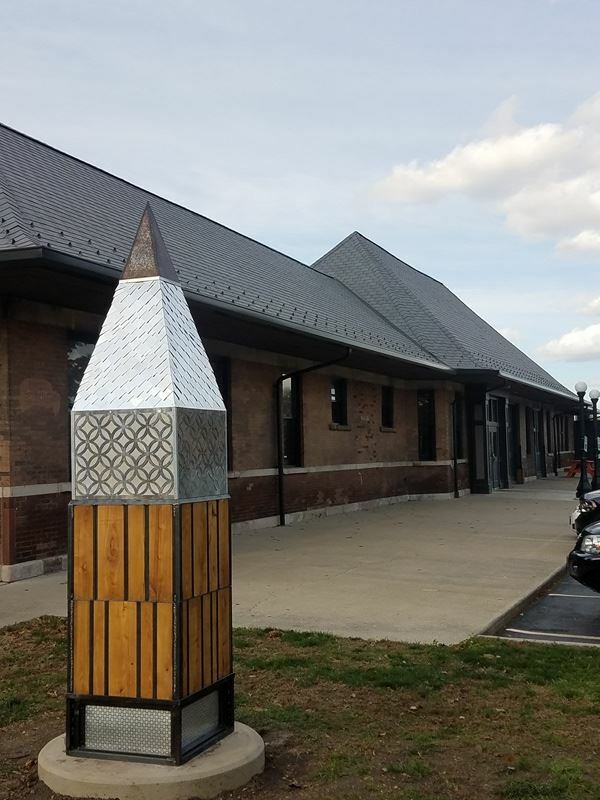 A big thank you to "The Old Depot" for their site sponsorship of this piece! The Public Art League is proud to welcome "Three Red Houses" by artist Andrew Arvanetes (Dekalb, IL) to the Boneyard Creek Crossing in Urbana. 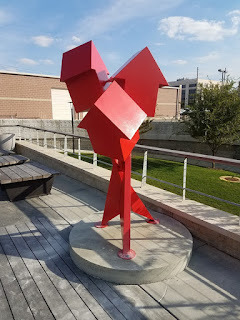 The sculpture is installed on the east side of Race Street (near the corner of Race and Griggs) by the Station Theater. The artist states: "I am fascinated with the common house form and how it symbolizes family, security and the "American Dream." The color red is associated with danger and in this case refers to the uncertain times common to many in our society. These two conflicting ideas are presented in a visually dynamic "bouquet" arrangement. My sculptures have always been object-oriented and narrative in nature. The interpretation of my work may not be exactly the same as the intended narrative. More important, the viewer should be able to feel a connection based on their own personal experiences. I attempt to achieve this connection with my audience by utilizing universal visual details. The mechanical and architectural details utilized in my work have evolved into a personal language. These details and symbols combine with the overall form to create a visual aesthetic. Because of my formal approach to fabrication, rational functionality might be expected. On the contrary, the combination of physical scale, personal references and visual details often results in a whimsical and absurd reality." A big thanks to The City of Urbana and the Urbana Public Arts Program for making this installation a reality. A nice article by Melissa Merli in Sunday's News Gazette (11/6/16). 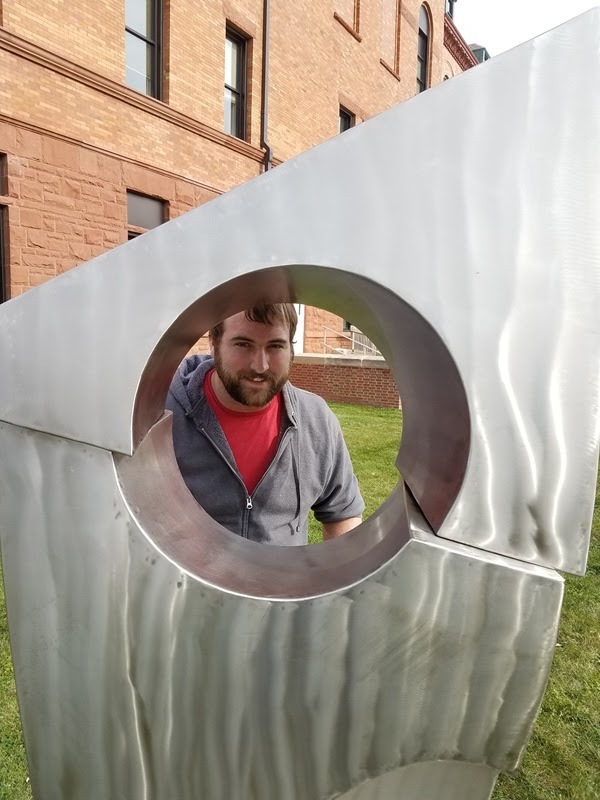 The Public Art League is proud to welcome "Monolith" by Timothy Jorgensen (Cedar Falls, IA) to downtown Urbana. The sculpture was installed on the south side of the Champaign County Courthouse near the corner of Elm St. and Broadway Ave. The artist states that "Monolith" was created with the idea of monolithic formations found throughout history. As the shifts break the piece into sections it creates a sense of shifting time. The piece creates the notion of a human figure to exemplify existence. It encompasses the idea of time we as humans have spent on Earth as well as the trials we have experienced. 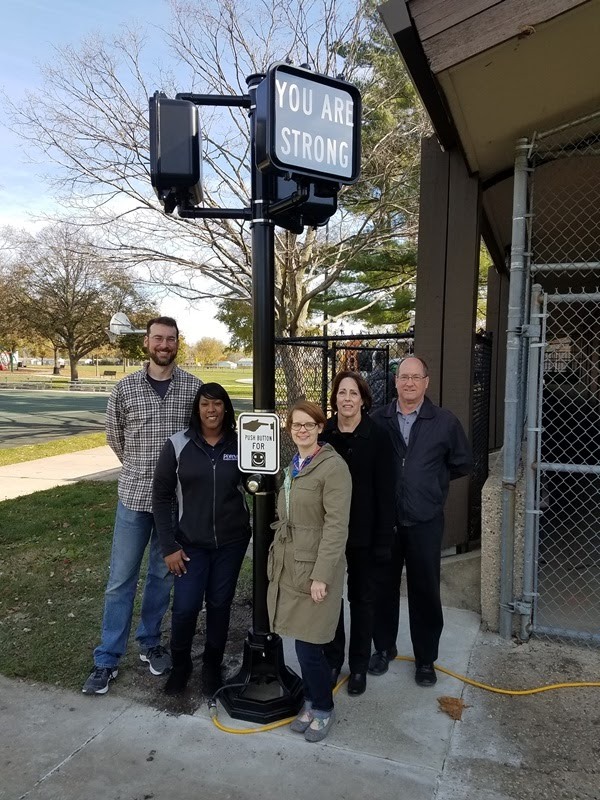 Thank you to the City of Urbana, the Urbana Public Arts Commission and Champaign County for their assistance in making this installation possible.